One of my children’s favorite table top activity is coloring, I love watching their faces light up when a blank piece of paper comes to life with a beautiful picture they have created! Coloring and creativity is so important for young minds plus it helps develop those very important fine motor skills! Wonder Forge offers a variety of games, puzzles and activity books for your every member of your family, young and old! From preschool games with Curious George to family games like Konexi, Wonder Forge has the perfect game for your family to enjoy! We personally own quite a few Wonder Forge games and I can’t wait to introduce my children to our brand new activity books! The Disney Imagicademy Science and Animals Activity Books are the perfect hands on activity for little ones! Your child can roam through the wild animal kingdom with Mickey Mouse and Disney Pals or explore the four seasons with Disney’s Frozen characters like Elsa and Olaf! Mickey Mouse will teach your child about the fascinating lives of insects, how animals adapt to their surroundings, the reason behind animal conservation and so much more! This fun and colorful animal activity book is perfect for preschoolers and kindergartners! From fun puzzles to surprising experiments, your Frozen fans will be excited to learn about the four seasons, rainbows, the natural beauty of snowflakes and more! This science activity book is geared for ages four and up, ideal for kindergartners up to 4th grade. The Disney Imagicademy Science Activity Book contains 60 pages of activities, 8 colored pencils, 8 sheets of stickers, 1 pair of rainbow viewer glasses, 1 spray bottle, 6 color dye tablets and a zipper storage pouch. The Disney Imagicademy Animals contains 60 pages as well, 8 colored pencils, 8 sheets of stickers, 4 piece roller stamper, 1 magnifying glasses, 1 uv glow pen and a zipper storage pouch. Wouldn’t your child love to find these activity books under the Christmas tree? Connect: Be sure to stay connected with Wonder Forge on Facebook and Twitter! 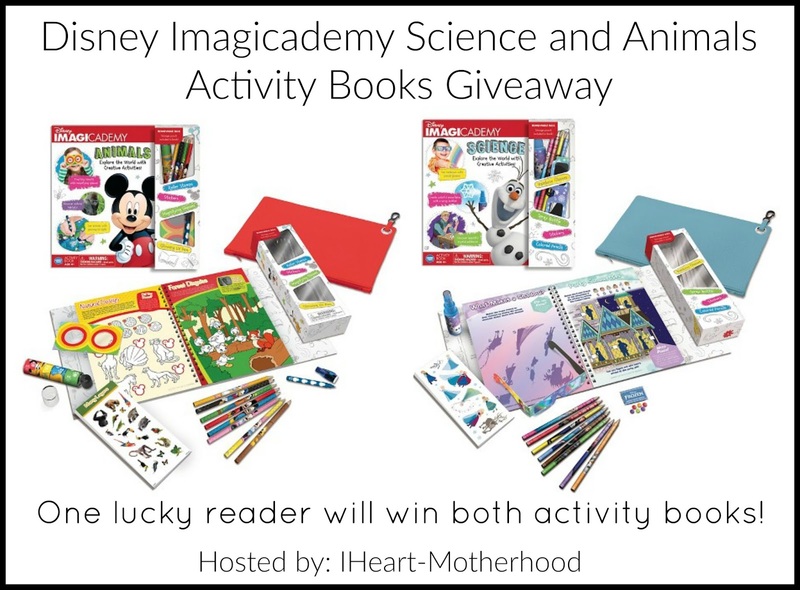 Buy it: Purchase the Disney Imagicademy Science and Animals Activity Books at Target! Win it: One lucky reader will win both activity books!